Sunset photograph at big bend on the Mullica river. The Mullica rises in central Camden County, near Berlin, on the southeastern fringes of the New Jersey suburbs of Philadelphia. It flows generally east-southeast across the state, crossing the Wharton State Forest. 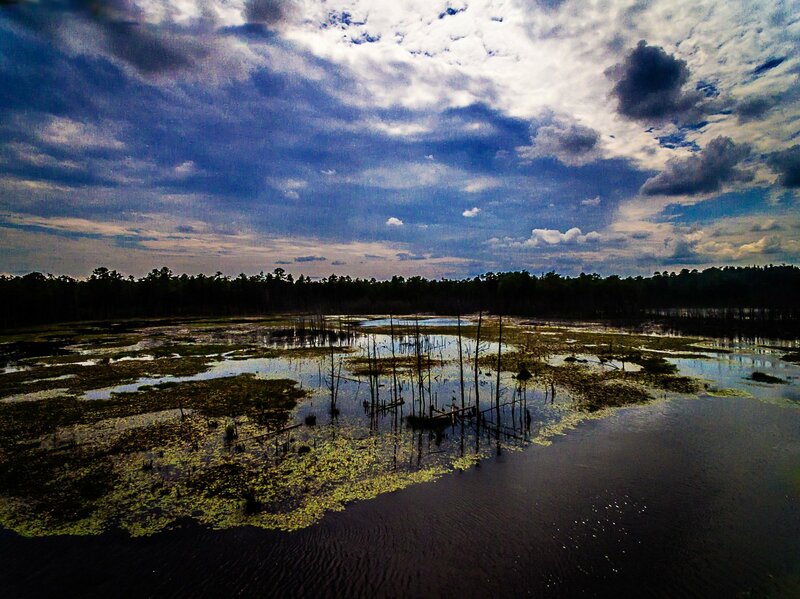 Near The Forks, where it receives the Batsto River, the Mullica broadens into a navigable river approximately 20 miles (32 km) long, stretching east-southeast and emptying into Great Bay approximately 10 miles (16 km) north of Atlantic City. It becomes brackish below the bridge at Green Bank. Approximately 3 miles (5 km) upstream from its mouth on Great Bay, it receives the estuary of the Wading River from the north. Approximately 2 miles (3 km) upstream from its mouth, it receives the Bass River from the north. The watershed drained by the river and its tributaries measures about 568 square miles, and is composed primarily of pine forests and scrub habitat.